As yet another proof that we are really nailing it, Prograils were listed among the leaders of B2B service providers in the most recent report by Clutch. 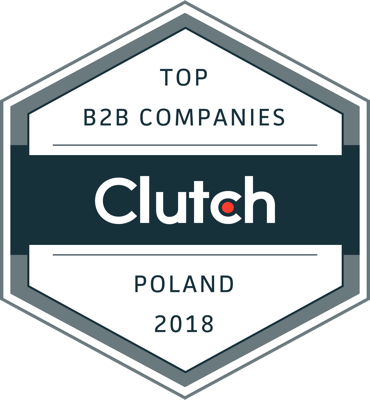 According to Aaron Morales, Clutch’s business analyst, the “companies featured in the report not only managed to distinguish themselves from the competition but also proved their ability to deliver high-quality services to a variety of clients around the world”. The report, featuring the names of 250 top Polish companies active in software development, web design and UX services, is a result of research based on verified client reviews, services offered, work quality, and market presences. The results were published on June 26, 2018. Clutch is a Washington D.C. based research, review and rating company that connects small and medium businesses with the best-fit agencies, software, or consultants. We’ve had a working relationship with them for well over three years now. For all this time, we have been asking our partners to share their working experience with Prograils. Based on their accounts, we have received a number of high notes. During our cooperation, Clutch analysts managed to collect an outstanding feedback on our performance and quality of our work. In 2015, Prograils were recognized as a Leading Top Software and Web Development Firm in Poland. Being another recognition behind our belt, the leadership among B2B service providers in our geographical region, is a stimulus to improve our work and deliver constantly better services to our partners. Check our performance at Prograils’ official profile on Clutch.